Not to be confused with Charlottenberg, Sweden or Charlottenberg, Rhineland-Palatinate. Charlottenburg (German pronunciation: [ʃaɐ̯ˈlɔtənˌbʊɐ̯k]) is an affluent locality of Berlin within the borough of Charlottenburg-Wilmersdorf. Established as a town in 1705 and named after late Sophia Charlotte of Hanover, Queen consort of Prussia, it is best known for Charlottenburg Palace, the largest surviving royal palace in Berlin, and the adjacent museums. Charlottenburg was an independent city to the west of Berlin until 1920 when it was incorporated into "Groß-Berlin" (Greater Berlin) and transformed into a borough. In the course of Berlin's 2001 administrative reform it was merged with the former borough of Wilmersdorf becoming a part of a new borough called Charlottenburg-Wilmersdorf. Later, in 2004, the new borough's districts were rearranged, dividing the former borough of Charlottenburg into the localities of Charlottenburg proper, Westend and Charlottenburg-Nord. Charlottenburg is located in Berlin's inner city, west of the Großer Tiergarten park. Its historic core, the former village green of Alt Lietzow, is situated on the southern shore of the Spree River running through the Berlin glacial valley. The Straße des 17. Juni road, former Charlottenburger Chaussee, which runs eastwards from Charlottenburg Gate through the Tiergarten park to Brandenburg Gate, connects Charlottenburg with the historic centre of Berlin-Mitte. In the north and west, the Berlin Ringbahn and the Bundesautobahn 100 (Stadtring) mark the border with the Charlottenburg-Nord and Westend suburbs. 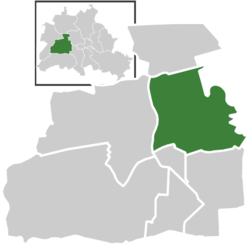 Adjacent in the south is the territory of Wilmersdorf. Charlottenburg also borders on the district of Halensee in the southwest, as well as on Moabit, Hansaviertel and Tiergarten (all part of the Mitte borough) in the east and on Schöneberg in the southeast. Archaeological findings in the area date back to the Neolithic era. Within the Margraviate of Brandenburg, on the land occupied by nowadays Charlottenburg there were three settlements in the late Middle Ages: the farmsteads Lietzow (pronounced leat-tsow) south of the Spree and Casow (pr. caasow) beyond the river, as well as a further settlement called Glienicke (pr. gleanicke). Although these names are of Slavic origin, the settlements are likely to have had a mixed Slavic and German population. Lietzow (also called Lietze, Lutze, Lutzen, Lütze, Lützow, Lusze and Lucene) is first documented in a 1239 deed. In 1315, Lietzow and Casow became the property of the Sankt Marien nunnery in nearby Spandau. As a result, the Lietzow farmstead probably was expanded to a village. In the course of the Protestant Reformation, Elector Joachim II Hector of Brandenburg confiscated the estates and dissolved the nunnery in 1558. While the Lietzow area has been populated continuously, Casow and Glienicke were abandoned. From old field names it is believed that Glienicke lay in the area of the present day streets Kantstraße, Fasanenstraße, Kurfürstendamm and Uhlandstraße at the former Gliniker Lake (now dry, there's another Glienicke Lake in the Wannsee locality). The development of Lietzow is well documented. For more than four hundred years, members of the Berendt family were mayors and thus had to pay lower taxes. Ecclesiastically, Lietzow came under the Wilmersdorf parish, the priests reached it from there by the so-called Priesterweg (priest's way), on the line of the streets now called Leibnizstraße, Konstanzer Straße and Brandenburgische Straße. In 1695, Sophia Charlotte of Hanover received Lietzow from her husband, Elector Frederick III of Brandenburg, in exchange for her estates in Caputh and Langerwisch near Potsdam. Frederick had a summer residence built there for Sophie Charlotte by the architect Johann Arnold Nering between 1695 and 1699. After he had crowned himself Frederick I, King in Prussia, the Lützenburg castle was extended into a stately building with a cour d'honneur. The Swedish master builder Johann Friedrich Eosander supervised this work. Sophie Charlotte died in February 1705; shortly afterwards the settlement facing the palace was called Charlottenburg - the palace itself became Schloss Charlottenburg - and chartered as a town on April 5, 1705. The king served as the town's mayor until the historic village of Lietzow was incorporated into Charlottenburg in 1720. Frederick's successor as king, Frederick William I of Prussia, rarely stayed at the palace, which depressed the small town of Charlottenburg. Frederick William even tried to revoke the town's privileges. With the coronation of his successor Frederick II inl 1740 the town's significance increased, as regular celebrations again took place at the palace. Between 1740 and 1747 Georg Wenzeslaus von Knobelsdorff built the eastern New Wing as Frederick's residence. Later, Frederick II preferred the palace of Sanssouci, which he had partly designed himself. When Frederick II died in 1786, his nephew Frederick William II succeeded him, and Charlottenburg became the favourite royal residence, and remained so for his son and successor Frederick William III (reigned 1797-1840). After the defeat of the Prussian army at Jena in 1806, the French occupied Berlin. Napoleon took over the palace, while his troops made a camp nearby. Charlottenburg became part of the new Prussian Province of Brandenburg in 1815 after the Napoleonic Wars. In the late 18th century, Charlottenburg's development did not depend only on the crown. The town became a recreational area for the expanding city of Berlin. Its first true inn opened in the 1770s, in the street then called Berliner Straße (now Otto-Suhr-Allee), and many other inns and beer gardens were to follow, popular for weekend parties especially. Berliners seeking leisure and entertainment came by boat, by carriage and later by horse-drawn trams, above all to a large amusement park at the shore of the Spree river called Flora, that went into bankruptcy in 1904. From the 1860s on the wealthy Bourgeoisie of Berlin discovered Charlottenburg as a residential area, among the first were Gerson von Bleichröder and Ernst Werner von Siemens, who had a villa built in the Berliner Straße in 1862. At the same time industrial companies like Siemens & Halske and Schering erected large factories in the north-east, at the border with the Moabit district of Berlin. In 1877 Charlottenburg received town privileges and until World War I saw an enormous increase of population with 100,000 inhabitants as of 1893 and a population of 306,000 in 1920, being the second largest city within the Province of Brandenburg, after Berlin. In the course of industrialization in the 19th century, much of Charlottenburg was incorporated in a network of streets laid out in the Hobrecht-Plan in an area that came to be known architecturally as the Wilhelmine Ring. The development was accompanied by an urban planning of broad streets and sidewalks, parks and spacious residential buildings, especially around the southern Kurfürstendamm area, which enabled large parts of Charlottenburg to preserve their affluent residential character. "The richest town of Prussia" established a Royal Technical College in 1879 (which later became the Berlin Institute of Technology), followed by the Physikalisch-Technische Reichsanstalt and the College of the Fine Arts. A new town hall with a 88 m (289 ft) tall spire was erected on the occasion of its 200-year jubilee in 1905 and an opera house opened in 1912. The history of Charlottenburg as a municipality in its own right ended with the Greater Berlin Act of October 1, 1920, when the town became a part of Berlin. The Province of Brandenburg was administered in Charlottenburg from 1918 until the province's dissolution in 1946 after World War II. In the 1920s the area around the Kurfürstendamm evolved into the "New West" of Berlin, a development that had already started around 1900 with the opening of the Theater des Westens, the Café des Westens and the Kaufhaus des Westens, followed by several theatres, cinemas, bars and restaurants, which made Charlottenburg the Berlin centre of leisure and nightlife. Artists like Alfred Döblin, Otto Dix, Gottfried Benn, Else Lasker-Schüler, Bertolt Brecht, Max Liebermann, Stefan Zweig and Friedrich Hollaender socialized in the legendary Romanisches Café at the Kaiser Wilhelm Memorial Church. However the days of the Golden Twenties came to an end with the rise of the Nazi Party. In World War II the area around the Breitscheidplatz was heavily damaged by air raids and the Battle of Berlin. Nevertheless after 1945 the Kurfürstendamm area quickly regained its importance, as with the partition of the city in the Cold War it became the commercial centre of West-Berlin. It was therefore the site of protests and major demonstrations of the late 1960s German student movement, that culminated on June 2, 1967 when student Benno Ohnesorg was shot by a police officer during a demonstration against Mohammad Reza Shah Pahlavi at the Deutsche Oper. Before the reunification of Berlin, Charlottenburg was the center of West Berlin, with many high market bars and restaurants. After 1990 German reunification Charlottenburg struggled with the rise of the Mitte borough as Berlin's historic centre. The "City West" is still the main shopping area, offering several major hotels, theatres, bars and restaurants. The area around Charlottenburg's Kantstrasse is Berlin's chinatown in the West, with a high concentration of Asian shops, gastronomy and inhabitants. It is commonly dubbed Kantonstrasse, in reference to the southern Chinese province of Guangdong. ^ Schulte-Peevers, Andrea. Lonely Planet Germany. Lonely Planet. 2007. 114. ISBN 1-74059-988-8, ISBN 978-1-74059-988-7. "Charlottenburg". The New Student's Reference Work. Chicago: F. E. Compton and Co. 1914. This page uses content from the English language Wikipedia. The original content was at Charlottenburg. The list of authors can be seen in the page history. As with this Familypedia wiki, the content of Wikipedia is available under the Creative Commons License.